Any city could be proud if its subcultural heritage was kept up like the one of Bristol is. Bristol Archive Records is way more than just a label – it’s a museum, a history lesson, a record shop, a discography, a band / gig / fanzine archive, a publisher, and more. The aspiration is huge: to “reissue [the] entire back catalogue of [Bristol]”. You just have to feel the love, effort and passion that is put into this project. DIY at its best! Their latest thing is a compilation of Reggae tunes recorded in the area of Bristol entitled “The Bristol Reggae Explosion 1978 – 1983″. Thanks to Martin Langford (neither the sax therapist nor the drag queen), who is responsible for the liner notes, I was able to give the album (that will be out in february 2011) a listen in advance. The selection isn’t less than superb. The Black Roots have always been a UK Roots favourite of mine and it’s a pleasure that their amazing “Juvenile Delinquent” is included. The name “Restriction” didn’t ring a bell for me, but their “Four Point Plan” is a killer tune with a heavy rhythm and extraordinary and unique DJ vocal styling. Even as a person who usually doesn’t like Lover’s Rock too much I really do like Sharon Bengamin’s “Mr.Guy”. Joshua Moses’ “Pretty Girl” is another favourite on this carefully compilated album. 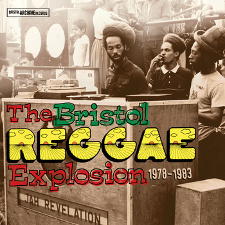 “The Bristol Reggae Explosion 1978​-​1983″ will be available on CD and can be downloaded in advance. To get an idea of the amazing cover artwork, check www.beezerphotos.com. The 12 page sleeve notes will be written by Reggae authority Martin Langford. But it’s the announcement of “a very limited vinyl pressing” that will put a glance in the eyes of the collectors out there. Count me in there, please. What else is there to say but the mandatory: Go get it! To read more about the Bristol Reggae scene, go there and enjoy. With a significant 50′s Windrush era West Indian community, the St Paul’s riot in 1980 and it’s earlier history as a port central to the 18th Century transatlantic slave trade, Bristol has been something of a microcosm of the trials and tribulations of the black community in the UK. As such it’s hardly surprising that in the 70′s and beyond the city should have had a thriving reggae scene. The Bristol Reggae Explosion 1978-83 from Bristol Archive Records, available for download now and on CD and LP in February of next year celebrates the bands and artists that in the face of some adversity produced some great and memorable reggae music. The biggest bands of the period, Talisman and Black Roots are well represented with three tracks each and the great Africa Is Our Land by Joshua Moses, is present and correct (which will save you £60-£100 on the cost of the original 12″ on ebay). Rescued from obscurity are a couple of solid 80′s roots tunes from Restiction and some lovers tracks by The Radicals, Sandra Bengamin and Buggs Durant. I’ve got a promo copy for the car and have particularly enjoyed Ressurection’s – Four Point Plan, apparently Ressurection featured a young Rob Smith on guitar, he’s better known now as Smith of Smith N’ Mighty, reknowned remixers. Like a lot of good things, he hails from Bristol. Bristol is and was one of the important musical and particularly Jamaican musical hotspots in the UK, and alongside Birmingham and London is was where it was all happening back in the day, check out your intro into the Bristolian affect on this release, heartily recommended. From Pop to Punk, the late seventies and early eighties saw a huge explosion in the number of local bands as more and more people thought they’d give it a go, new studios and independent labels weren’t far behind and Reggae wasn’t going to be left out of the musical mix.If the majors were even aware of Bristol they showed minimal interest and it was left to the bands themselves and the handful of indie labels to document Bristol’s contribution to what was then a vibrant UK Reggae scene. Working on tight budgets and with no money for marketing campaigns local bands managed to release a small, but steady flow of vinyl, mostly pressed in tiny quantities and often sold direct to fans at gigs, these records, although cherished by those who own them, and sought by those in the know, have been largely ignored by the wider music industry. Fortunately Bristol music has its own champion in the shape of Bristol Archive Records, a label with a mission to share our great musical heritage with the world, “The Bristol Reggae Explosion 1978-1983” is the first and only attempt to document the local Reggae scene from the late seventies until the early eighties. With the exception of the Black Roots tracks none of the recordings have ever been reissued and all were originally released before CD had been launched, so this is their debut in the digital format. The music itself reflects the dominance of the Roots style in Bristol, even today Roots is by far the most popular type of Reggae in both the retail and live scenes locally, Black Roots live up to their name and show why they were the equal of any UK Reggae band in their day, Talisman, Restriction and 3D Production follow in their Roots footsteps, but a real highlight of this release is the inclusion of the ultra rare “Africa Is Our land” from Joshua Moses, a UK Roots classic. Bristol wasn’t all about Roots though and the other tracks follow a more mellow template, dealing with love and relationships, both Talisman and Joshua Moses show another side to their music and are joined by tracks from Buggs Durrant, The Radicals and Sharon Bengamin who’s “Mr. Guy” is a classic UK Lover’s track in the mould of Janet Kay, Carroll Thompson, Louisa Marks et al. “The Bristol Reggae Explosion 1978-1983” will be released as a fourteen track CD, but you can’t have a proper Reggae release without it being on vinyl so there will be a very limited vinyl pressing featuring an eight track selection and just to keep things local the sleeve art is a mid-eighties carnival shot from Bristol’s own Beezer, (www.beezerphotos.com), featuring a classic image of Jah Revelation sound-system. Martin Langford, Steve Street, Sam Giles, Gene Walsh/Joshua Moses / Shoc Wave, Brendan, Des, Denison / Talisman, Jabulani Ngozi / Black Roots, John Carley, Rob Smith / Restriction, Adrian at Great Bear, Lloyd Harris / Chris Parker/Recreational Records, Alfredo / Nubian Records, St.Pauls Carnival Office / Steve , Thomas Brooman CBE / The Bristol Recorder People, Gary Chapple and “all the musicians who played on these tracks”. An appropirate follow up to their vinyl-only collection of Bristol’ss origianal punks, The Cortinas, sees the archivists of Bristolian punk release this LP of 11 tracks by the band considered the second on the scene. It’s such a typical story it’s cliche, but the guys who formed The Pigs did so after seeing The Cortinas, realised that there was something different about them than being just another pub-rock act and felt compelled to start their own band as a result. Nothing new there – and really there’s nothing particularly memorable in the enthusiastic but limited end result because what they recorded in one day at Sound Conception Studio on 12 August 1977 is typical third-tier punk with ricochet quick barrages against The National Front and for Nuclear Disarmament. Great to have,as it totally captures the essence of a time now gone, but nothing to mark it out either. Four tracks laid down that day, with Miles Copeland behind the financing, comprised an EP, Youthanasia, on the New Bristol imprint (some digging around suggests a copy of that would set you back about £15 today) but the remainder has gone unheard until now.